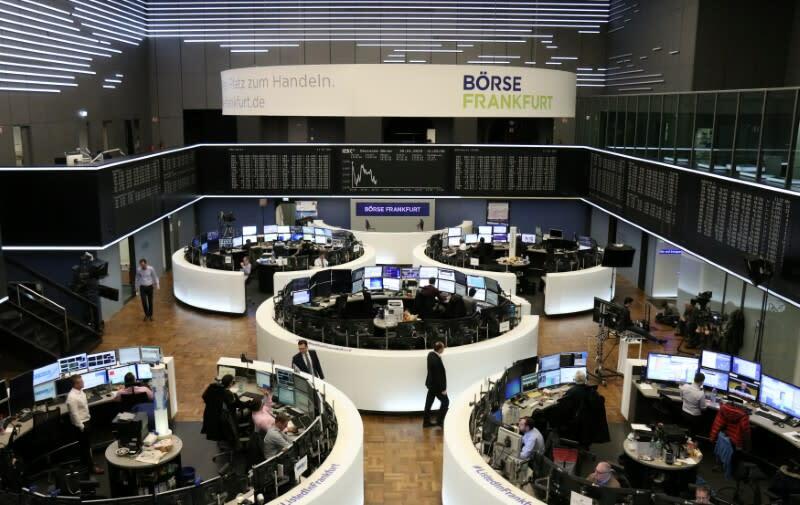 LONDON (Reuters) - European shares fell sharply on Thursday ending a seven-session run of gains as a batch of worrying trading updates in a wide range of sectors combined with the European Union cutting its growth forecasts to weigh on markets. Europe's STOXX 600 ended the day down 1.5 percent, its biggest retreat since December 27, while Germany's DAX sank 2.7 percent as disappointing December industrial data reinforced worries about the euro zone's economic powerhouse. "Eurozone stocks are suffering greatly as investors are fearful the region could be in for an economic downturn", wrote David Madden from CMC Markets, adding that should the UK leave the EU without a deal, the deteriorating economic conditions could not come at a worse time. London's FTSE was down 1.1 percent after the Bank of England said Britain faces its weakest economic growth in a decade this year as uncertainty over Brexit mounts and the global economy slows. Market angst was also exacerbated by a CBC report which said a meeting between President Donald Trump and Chinese President Xi Jinping was "highly unlikely" to take place by a key March deadline set by the two countries for reaching a trade deal. Earnings season also brought its share of worries. Publicis dropped 14.8 percent, its biggest one-day fall since 1992, as investors punished the world's No.3 advertising company for weaker-than-expected revenues. Deutsche Bank downgraded the stock to 'hold' from 'buy' after the results raised worries about account losses and softening marketing spending. "The scale of the miss in the fourth quarter took us by surprise, with attrition among existing accounts negating new business gains," Deutsche Bank analysts said. "What’s more, it appears that the trend is due to continue into the first quarter of 2019." Tour operator TUI sank 19 percent and poured more cold water on the travel sector, the latest to blame last summer's hot weather and the weaker pound for weaker-than-expected profits. GEA Group sank 17.7 percent to the bottom of the STOXX 600 after the German food processing machinery maker scrapped its mid-term targets and flagged a profit decline this year. European automotives also took a hit after Fiat Chrysler (FCA) shares fell 12 percent as weaker-than-expected guidance for profits and industrial free cash flow raised doubts about the Italian-American carmaker's longer-term targets. The sector lost 4.9 percent with Daimler, Faurecia and Valeo falling between 5 and 7 percent. In the banking sector, Societe Generale was down 6.8 percent after the French bank slashed its profitability targets, hit by the market downturn last year and following its profit warning in January.